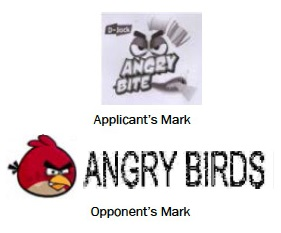 The Applicant’s Mark was similar to the Opponent’s ANGRY BIRDS mark (the “Opponent’s Mark”), registered in Classes 3, 9, 14, 16, 18, 20, 21, 24, 25, 27–30, 32–36, 38, 41 and 43, such that there was a likelihood of confusion. Moreover, the Opponent’s Mark was well known in Singapore and well known to the public at large. The opposed application was contrary to the provisions of the law of passing off and the law of copyright. In examining the similarity of the marks in question, the Registrar relied on the step-by-step approach, which states that the examination should be based on (1) similarity of marks, (2) similarity of goods and (3) likelihood of confusion arising as a result of the first two elements. In applying the three-step test, the Registrar took the view that there was no visual or conceptual similarity between the marks at issue, and that, while there was a certain degree of aural similarity, it would not result in a likelihood of confusion based on a comparison of the marks in their entireties. While the Opponent’s Mark was well known in Singapore, it could not, the Registrar held, be considered to be well known to the public at large: Trademarks that were well known to the public at large formed a “rare and exclusive class,” and the Registrar was of the view that the Opponent had not submitted sufficient evidence to support its assertion. For example, the sales/promotion figures submitted by the Opponent were not sufficient. It is worthy of note that in the Preliminary Comment the Registrar mentioned that “there is nothing objectionable in being ‘inspired’ per se in that, not everything ‘inspired’ by an existing work is necessarily objectionable.” As this case clearly articulates, an evaluation of similarity of marks should be based on a consideration of each mark as a whole, especially when one of the marks at issue is a composite mark. The decision is unique in that the Registrar clearly enunciated that whether or not a mark “inspired” by an existing work can ultimately be regarded as objectionable will depend on whether an opponent can establish one of the grounds of opposition in the Act, which in turn is very much dependent on the particular facts of each case. It further highlights that a mark- for-mark comparison must be done to assess similarity, such that a word mark or a device mark by itself should not be compared with a composite mark. This article first appeared in INTA Bulletin. For further information please visit http://www.inta.org/INTABulletin/Pages/INTABulletin.aspx.